We have recently published a patch to provide full database encryption for PostgreSQL. Many business critical applications require full encryption to match legal or business requirements. As more and more customers asked for this, we decided to tackle this important issue. The idea behind our patch is to store data on disk in encrypted format and decrypt blocks as they are read from disk into shared buffers. As soon as a block is written to disk again, it will be encrypted automatically. Note that the entire instance is encrypted. Our patch can be downloaded here. The key has to be provided before initdb otherwise the instance cannot be created. While database side encryption makes sure that data is stored safely on the node, it does have some impact on performance. To figure out how large the impact might be I decided to run some simple tests showing what is going on. 4 concurrent threads hammered the database for a minute (read only). As expected the results depend very much on the configuration of PostgreSQL. Remember, a block has to be encrypted when it goes to disk and decrypted when it is fetched from the kernel. Naturally small values for shared_buffers tend to ruin performance while large shared_buffers settings tend to be very beneficial for encryption. 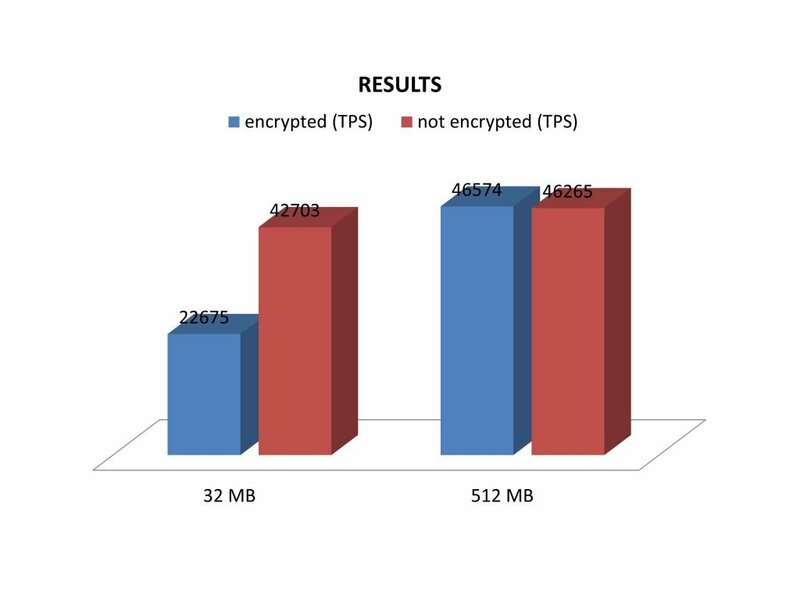 The data set we are using here is around 130 MB in size, so that quite some time is wasted during encryption and decryption. Naturally the difference decreases as more memory is added. As soon as the entire database fits into memory the performance difference will drop to close to zero as expected. The current AES-implementation is not too great, however. We have a prototype AES-NI implementation that does 3GB/s per core on a Haswell based system (1.25 B/cycle). Intel offers some very nice hardware support for encryption so this is surely the way to go.